Frank Botta is Chair of the Transportation Practice Group. He also is a member of the Labor and Employment, Litigation and Alternative Dispute Resolution Groups. Board of Directors of the Canadian Transportation Lawyers’ Association. In addition to his transportation practice, Frank has extensive experience in advising and assisting clients with labor and employment matters including employment discrimination, sexual harassment, unfair labor practice, union election campaigns, collective bargaining, grievances and commercial and corporate litigation in both federal and state courts. He counsels clients with employment-related investigations involving claims of employee misconduct and also with workplace incidents involving the Occupational Safety and Health Act (OSHA). He represents companies before federal and state agencies including the Department of Labor, Equal Employment Opportunity Commission (EEOC), National Labor Relations Board (NLRB), Office of Federal Compliance Programs (OFCCP) and Pennsylvania Human Relations Commission (PHRC). 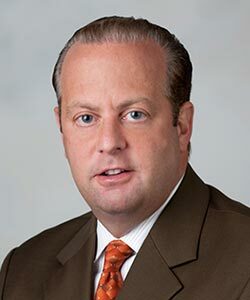 Frank is a an experienced trial attorney who has successfully litigated in a spectrum of civil disputes in both state and federal court systems in a variety of complex commercial litigation matters. He also is a trained mediator with the U.S. District Court for the Western District of Pennsylvania and an arbitrator with the American Arbitration Association and FINRA. He has served as the Management Chair of the American Bar Association Labor and Employment Section, Alternative Dispute Resolution Section. Frank earned his J.D. from Temple University School of Law and a B.A. in Economics from Washington and Jefferson College. He is rated AV Preeminent, the highest peer rating standard, by Martindale-Hubbel. Prior to joining The Lynch Law Group, Frank served as in-house counsel at Caliber Systems, Inc. (formerly known as Roadway Services, Inc. and RPS, Inc.). Most recently he was Vice President and General Counsel for Samuels and Son Seafood Co., Inc., the largest seafood wholesaler in the Northeast region. AV® , AV Preeminent® , Martindale-Hubbell DistinguishedSM and Martindale-Hubbell NotableSM are Certification Marks used under license in accordance with the Martindale-Hubbell® certification procedures, standards and policies. Will Pennsylvania Be Next To Mandate Sexual Harassment Training For Restaurant Employees? Does Title VII Mean Protection From Discrimination Based on Sexual Orientation? Do You Have Comprehensive Anti-Harassment Policies and Procedures In Place? The ADA is an Anti-discrimination Statute – Not a Medical Entitlement!